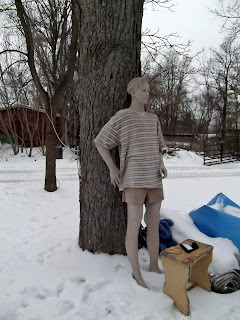 The fellow in the photo used to stand by my hot tub/pool, the one we have removed from my soon-to-be sun room. He held my towels for me. More than once I've seen delivery men try to talk to him through the window and I firmly believe he chased away a number of people with ill intentions . When Joe was working on my new wall, he cleared the debris out of the room and put this poor guy out in the snow. He was standing by the tree for a couple days, until he scared me half to death twice because Gibby barked and I looked out the window to see a strange man standing in the yard. I decided to stop scaring myself and put him in the barn where he could be peering out of the barn door and scare away people who don't want to be seen. I had forgotten how heavy he is, but I finally got him situated just inside the barn and forgot about him - until I was doing my chores in the stallion barn and stepped into the tack room - and saw him out of the corner of my eye. There is nothing scarier late at night when you are all alone in a quiet barn than a silent man just standing there! I'm just thankful he didn't speak to you!